Magnetic Ballasts – This style of ballast uses a single induction coil (typically a copper wire) in order to reduce the amount of charge in a given electrical circuit. Electronic Ballasts – This style will use a series of of inductions coils (versus the single coil of a magnetic ballast) and also regulates the amount of charge in a given electrical circuit. Magnetic vs. Electric: Which is better? When you compare these two styles of ballasts, the electric style is better on most accounts. It’s smaller in size, lighter in weight, more efficient at inducting current (by roughly 20%! ), doesn’t make any noise, prevents your lights from flickering and it will save you money. Plus, you can use an electric ballast to control the power to multiple lightbulbs within a fixture (unlike magnetic ballasts which can only control a single lightbulb). However, magnetic ballasts do have one very notable advantage: in very cold climates (where the ballast is going to be outside), magnetic ballasts will outlast electric by almost 10:1 in their lifespan. If you pick up on either one, than odds are you have a magnetic ballast. However, that’s not the only way to tell which type of ballast you have. Simply take your cell phone (or digital camera) and take a picture of your lights while they’re turned on. Now, look at your picture. Do you see any dark bands or stripes, sort of like a checker board? If so, you have a magnetic ballast. However, if your picture is clear, than the ballast is electric. This is because electric ballasts operate at a much higher frequency (20,000 hertz vs. 60 hertz for magnetic). Check out this photo from Envision Lighting to see how this looks. 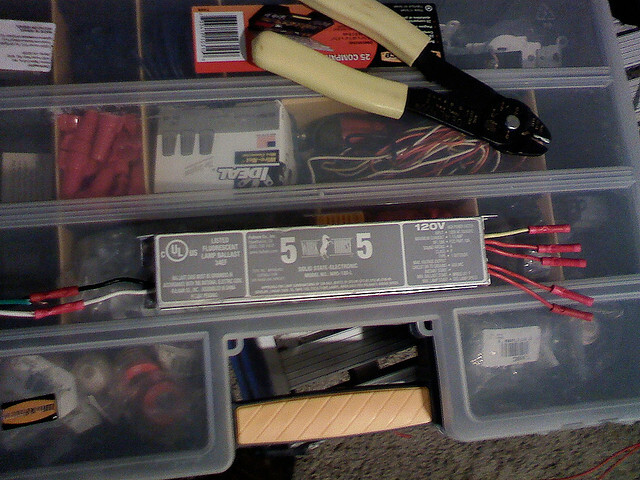 Can I swap out my ballasts myself? In short, yes. It is not rocket science, but you may also consider just finding plug-n-play LED T8’s instead of going through all the hassle. They cost more than regular bulbs, but they’re more flexible (they work in both magnetic and electric ballasts) and they’re much more energy efficient (using about 50% less electricity). Simple, yeah? If you’re at all unsure about the process of installing a new ballast, we recommend that you contact a professional to assist you.